Space History curator Margaret Weitekamp talks to a young visitor at the Women in Aviation & Space Family Day. Celebration of Women's History Month, March 8, 2008 at the Smithsonain National Air and Space Museum Steven F. Udvar-Hazy Center. Margaret Weitekamp is a space history curator at the Smithsonian's National Air and Space Museum in Washington. 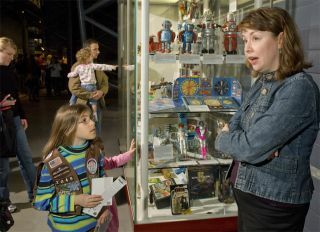 She manages the museum's collection representing the social and cultural dimensions of spaceflight, and has a background studying women's history. In honor of women's history month, SPACE.com spoke to Weitekamp about the strides women have made in spaceflight, and what the future holds. SPACE.com: Do you make a special effort to track down stories involving women in the history of spaceflight? Margaret Weitekamp: It's something that I always have a special attention for because of my background and my interest in women's history. It's something that we here at the museum have made a conscious decision not to put in its own little alcove, because women have always been a part of the stories of aviation and spaceflight. There have been women involved in aviation since the very beginning of the invention of the airplane. The Wright Brothers took their sister up. She was always around and a big part of their lives and allowing them to do what they wanted to do. And there have been women in aviation since then. In terms of spaceflight, especially in the space shuttle era, women have been an active part of that, both behind the scenes and as astronauts. Astronauts become the public face of spaceflight that people tend to focus on. Actually there's a rich story of the women who were engineers, mission controllers and who are part of the other scientific research and the support team of thousands that supports the shuttle. And I think the fact passed with very little notice a couple of years ago when Peggy Whitson was the commander of the ISS. And then Pam Melroy was commanding the shuttle that docked with it, and you had all women in charge. It was somewhat notable in that very few people noticed it. SPACE.com: Would you say that the United States is ahead of other spacefaring nations in including women? You don't see any Russian women flying these days, right? Weitekamp: Not these days. Obviously the very first woman in space was [Russian] Valentina Tereshkova, and the very first woman to do a spacewalk was Svetlana Savitskaya. So the Soviets started with women in the program, although not as a sustained part of the program. And it certainly has been something that since the 1980s NASA has been very interested in, an astronaut corps that reflects the face of the nation. There are still far fewer women than there have been men, but women have been well represented. SPACE.com: How did women first get involved in the U.S. space program? Weitekamp: I've actually written a book about the first women who were tested in the United States, the women who went out to the Lovelace Foundation, who've been called the Mercury 13. Dr. Randy Lovelace, who was one of the medical researchers at the time, had possibly heard rumors that the Soviet Union was looking at testing women. Lovelace also had the idea, well ahead of any human spaceflights, that someday we would have these orbiting space stations that would have dozens of people onboard, and if you were going to have an orbiting space station that would be a combination reconnaissance, laboratory, observatory platform, you would need to have women. In some ways it's extraordinarily advanced and cutting edge – he's thinking about women going into space in these super manned space stations years before you even have regular spaceflight. And in other ways he's very much a product of his time. He's thinking you're going to need women to effectively be the telephone operators. If you have laboratories, you're going to need laboratory assistants. That's a pink collar job. So you need a woman in that position, and we need to know if women's bodies can withstand what they were expecting for the rigors of spaceflight. SPACE.com: Why do you think the Soviet Union started off so inclusive of women but then backtracked? Weitekamp: For the Soviets, it seems to have been somewhat of a one-off. And my understanding is that Svetlana Savitskaya flew, but she's also a very well-connected person. Her father was in the military. So her position came partly out of her own abilities and partly from being so well-connected. And also partly out of the one-upmanship of the Cold War. She flew just ahead of Sally Ride [America's first woman in space], and she spacewalked just ahead of Kathy Sullivan [America's first female spacewalker]. SPACE.com: In the future, do you see women playing an even bigger role in spaceflight? Weitekamp: I think that women's presence in places is often seen as a sign that something is, almost-literally, domesticated. That it is safer. It's a way, historically, that aviation has always been sold. You know, it's safe enough for a woman to fly it. That was one of the things that Amelia Earhart and women of her generation were both demonstrating and fighting against. This idea that if a woman could fly it, then it can't be that hard. There's a famous picture of the four women who were taught to fly a bomber that was considered to be a mankiller, and the male pilots didn't want to fly it. So what they did was they went and they got four Women Airforce Service Pilots and they taught them to fly the bomber. And they toured it around and showed that women could fly this. And that was the end of that. They [the men] decided, ok, it must be safe enough. SPACE.com: Do you see any further barriers for women in spaceflight? Weitekamp: I think women have become very present. I think the barriers women are facing at this point, in terms of human spaceflight, are really the challenges of, is the United States or is the world going to go beyond low-Earth orbit again, and if so, in what way, and if we're going to have a sustained presence in low-Earth orbit, to what end? And I think that becomes a more universal problem in terms of human spaceflight right now. SPACE.com: Speaking of women in space, if space travel becomes more accessible to everyday people, would you go? Weitekamp: Yeah, I would. I'm not one to turn down a challenge, and I think if there was any decent reason to send a historian of popular culture, sure. Historians are going to have to start making a much better salary before we can line up to be on Sir Richard Branson's Virgin Galactic. SPACE.com: Do you have a favorite object in the collection? A bracelet in the collection of the Smithsonian Air and Space Museum belonged to Toni Foster, wife of an engineer who helped build the Mercury and Gemini space capsules. Weitekamp: I do. One that came the first week I came to work. We received, with a collection of papers, a charm bracelet that has a series of space charms and two jeweler's charms on it. It came from the collection of a man who was an engineer who worked for McDonnell, and they had created the Mercury and the Gemini capsule. And so this was the bracelet he gave to his wife, Toni Foster. When he did a project — he worked on the electrical systems on the spacecraft — he would bring his wife a charm for her charm bracelet. So the bracelet has a charm for the Mercury capsule, the Gemini capsule, an Atlas rocket, a Redstone rocket, and then two jeweler's charms. The family moved to and lived in Cape Canaveral for a number of years, and she was actually a schoolteacher in the schools there. So one of them says "Thank you Mrs. Foster," and it's from a 2nd or a 3rd grade class. I think it just tells the story of that marriage, it tells the story of that family, but then what I really like is it begins to tell the story of those communities that boomed, that grew up around space work. Engineers from all over the country were moving to Houston or to Huntsville, Alabama or to the Cape. And those families needed schools, and new grocery stores and new churches and roads that would take them places, and they wanted a town that had an opera, a theater and decent movies. And I'd like to think that this object, this bracelet tells that story, of the workforce that made this happen and of the larger communities that had to grow up around them to support them.